Annie Mathers is America’s sweetheart and heir to a country music legacy full of all the things her Gran warned her about. Superstar Clay Coolidge is most definitely going to end up one of those things. But unfortunately for Clay, if he can’t convince Annie to join his summer tour, his music label is going to drop him. That’s what happens when your bad boy image turns into bad boy reality. Annie has been avoiding the spotlight after her parents’ tragic death, except on her skyrocketing YouTube channel. Clay’s label wants to land Annie, and Clay has to make it happen. Swayed by Clay’s undeniable charm and good looks, Annie and her band agree to join the tour. From the start fans want them to be more than just tour mates, and Annie and Clay can’t help but wonder if the fans are right. But if there’s one part of fame Annie wants nothing to do with, it’s a high-profile relationship. She had a front row seat to her parents’ volatile marriage and isn’t interested in repeating history. If only she could convince her heart that Clay, with his painful past and head over heels inducing tenor, isn’t worth the risk. I'm kicking myself, y'all. I've had this book for months. I was lucky enough to get an early ARC and I knew I was going to read it before it came out. But wow! I really wish I'd read it sooner. I read the majority of it today and loved it so hard. These characters. Wow. They are both feeling so much, and in turn you really feel them and feel for them. The idea of two flawed people finding love is just so simply beautiful at its core, in contrast to the complication that the relationship inevitably is. The song lyrics hit all the right notes. (Sorry. Pun totally intended!) The ones that were supposed to be fun were fun, and the ones that were supposed to be deep really cut deep. I found myself flipping back to read different song lyrics as I went further into the book. Reading this book was an easy as Sunday morning. I just kept turning the pages like it wasn't even a thing. I was on a flight, but between the time I touched down to when I got home to finish it, I kept trying to sneak in a few words or sentences -- waiting for the shuttle, in line to pay my parking ticket, etc. I knew that I would adore this book, because I love all the contemporary romances (bring on the Kasie West, the Jennifer E. Smith, the Miranda Kenneally! ), but I don't think I really fathomed just how much. I think I may have found a new favorite YA contemporary author in Erin Hahn. 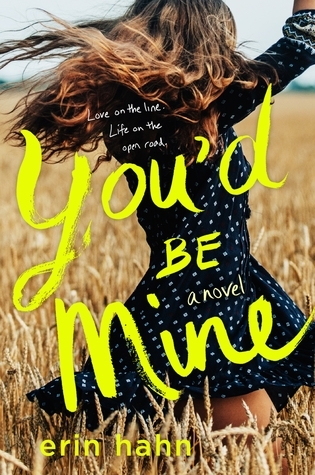 You'd Be Mine comes out April 2, 2019 from Wednesday Books.